Persia Goudarzi was an intern during fall 2018 at ISDP’s Stockholm China Center. Ms. Goudarzi graduated from Stanford University with a Masters of Arts in Russian, East European and Eurasian Studies. Her research interests include Sino-Russian relations and European security with a focus on the relationship dynamics between NATO and Russia. 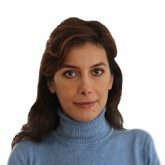 Ms. Goudarzi wrote her MA thesis on Sino-Russian relations in Central Asia under the framework of the Shanghai Cooperation Organization. Her undergraduate thesis examined Russia’s response to NATO expansion. Persia is a recipient of FLAS fellowship from the U.S. Department of Education and CLS scholarship from the U.S. Department of State. Ms. Goudarzi speaks Persian, English and Russian. Ms. Goudarzi’s professional experience includes working as a data control assistant at Stanford Libraries’ Metadata Department and operations manager assistant Stanford Science Library. She has also conducted archival research at the Hoover Institution in Stanford.